With the network of canals throughout Punta Gorda Isles, many residents keep their boats on lifts in their backyard. Heading home at sunset after a day on the water. Charlotte County is a waterfront paradise, with 120 square miles of cruising area in the harbor alone, and easy access to the Gulf of Mexico through the Boca Grande Pass. 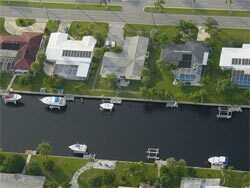 The network of canals in Punta Gorda Isles and Burnt Store Isles allow many homeowners the opportunity to keep their boat on a lift in the backyard, ready for year-round boating and fishing at a moment’s notice. Numerous marinas are available for in-water or dry storage, and public boat ramps are in plentiful supply for those who prefer to trailer their boats. There are 28 marinas and 13 boat ramps located along the Peace River, Cape Haze Peninsula, Lemon Bay and Placida Harbor areas. Fishing is popular in Charlotte County, and with good reason. Tarpon are the best-known big-game fish in local waters, with the “World’s Richest Tarpon Tournament” taking place every summer at the Boca Grande Pass. But tarpon aren’t the only fish in these waters. 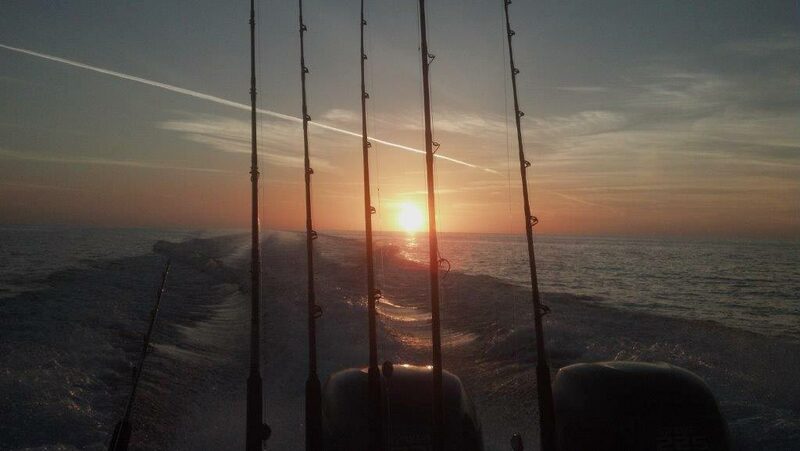 Also in abundance are snook, red snappers, mangrove snappers, trout, grouper, bluefish, and many other species. The Peace River, Myakka River, Shell Creek, and the many lakes and tributaries in the county are popular with freshwater fishermen. Sailors have plenty of room in the harbor for day sailing, and can easily head out through Boca Grande Pass and into the Gulf for more extended cruising. Protected anchorages are abundant. The balmy year-round weather encourages boaters to head out even in the winter months. A boater might head out to one of the barrier islands for some of the best shelling in the country, enjoy an al fresco lunch at the Cabbage Key Restaurant, or cruise up the Peace River to enjoy the scenic beauty and perhaps a stop at the Nav-A-Gator Bar and Grill for a delicious grouper sandwich. The protected harbor at Cayo Costa is a favorite week-end anchorage for sailboats and powerboats alike. 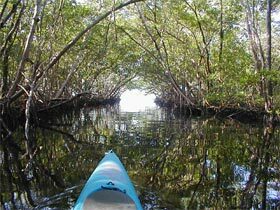 Kayakers and canoeists frequently enjoy the peace and scenic beauty of the creeks and tributaries of the Myakka and Peace rivers, where there’s no sign of humankind. The maze-like network of mangrove islands throughout the harbor are another popular spot. When the draft of your vessel exceeds the depth of the water, you are most assuredly …. aground! Florida has 11,761 square miles of inland water. There are 16.8 million boats in use on U.S. waterways.